Not every Friendly Local Shop is located in Central Indiana. There are great shops all around the state, that I just don’t have a chance to hit due to gas prices, and time. However, when I’m given the opportunity to travel to a different city, you can bet your sweet bippy I’m going to keep my eyes open for any shops to write about. 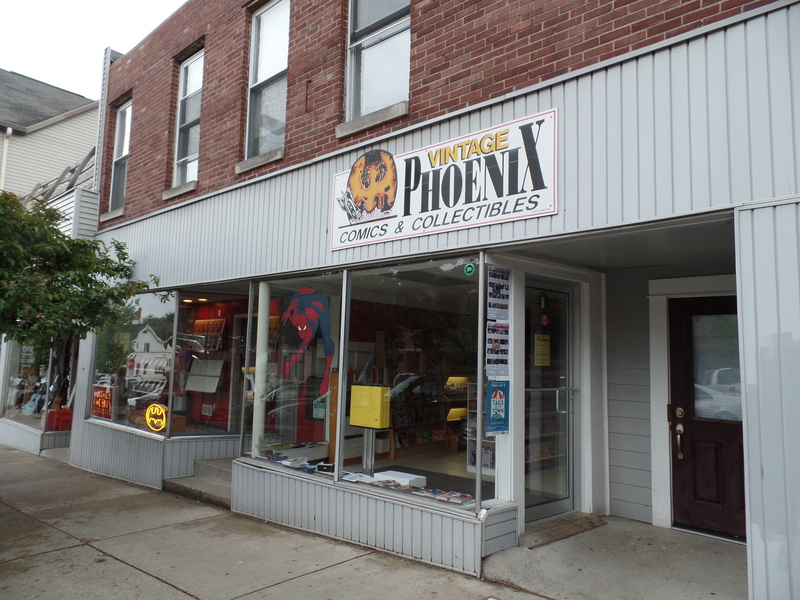 As luck would have it, as we were looking for parking for the Night Vale show a few weeks ago, we found a spot right beside a comic book shop I’ve heard good things about, down in Bloomington, called Vintage Phoenix. Especially since I was travelling with a couple of Geeks, it took no sweet talking at all to convince them to check the place out. Upon walking in, you notice that the store is very well lit and inviting. As I’ve said before, I’m thankful for shops who have realized they don’t need to be dank, dark, and dungeon-esque any more. In order to remain alive, they need to be well lit, smell pleasant (which isn’t hard with books! ), and be inviting to everybody. Vintage Phoenix accomplished this wonderfully. The staff was friendly, the shop was not in the least bit cramped, and they were very well stocked with all manner of books. Oh, the books. One thing I noticed was that Vintage Phoenix is very much primarily a comic shop. They had a section of books for children, a section for local and independent creators, and more. They have an interesting layout with different rooms, and two of those rooms were full of graphic novels by everyone, from the big publishers to the independents. They have (according to their website, I didn’t ask) 1,400 square feet, and it’s full of comic books. However, I didn’t see many toys and collectibles when I was there. Sure, they had some action figures around the displays, but they weren’t as prevalent as they are at many of the other stores I’m used to. This is not a bad thing, though. This shows a focus on the books, which I can appreciate, especially since they have so many of them! 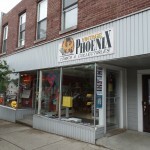 Vintage Phoenix is, from everything I can tell, a great resource for Bloomington! They are well stocked, have an inviting atmosphere, and are friendly! I’m looking forward to popping back in at the end of August when I visit the Indiana Toy and Comic Expo. If you’re interested in visiting, here’s what you need to know! What are they? They are a comic book shop, selling both new and back issues, as well as a great selection of graphic novels and trade paperbacks. Just kidding! It’s the future! Internet! Where are they online? You can find them at their website, on their Facebook page, and maybe they will start using Twitter again if we ask them really nice-like. Vintage Phoenix is amazing. They deserve every word of praise they get ! 🙂 So grateful to have them here in Southern Indiana. Thank you! I always worry about whether or not I’ve “read” a store wrong, whenever I write a review. When I hear that I’ve hit the nail on the head, I breathe a sigh of relief! Thanks for commenting! Thank you very much for visiting our shop and for the thoughtful review, Anthony! I’m the manager of Vintage Phoenix and am always interested in hearing feedback on the store, both good and bad. You’re absolutely correct, we are very focused on books here, in the 90’s and early 2000’s the store stocked a lot of toys but we’ve dramatically pared back on them over the years, and we’ve found we’re serving the majority of our customers better with the current product mix. But we’re always examining that mix, so who knows what the future may bring! And boy oh boy, you’ve got me pegged on our Twitter page, I’ve let it go to seed. Just not sure what to do with it to differentiate it from our other online presence, so unfortunately I ignored it. But we’re very active on Facebook, and I encourage anyone interested in the shop to follow us there. And we’re currently renovating the building exterior, so it will look much nicer when you visit us again in August. See you then! It was a pleasure to stop in! There is absolutely nothing wrong with focusing on the books, instead of books and collectibles. I just was thrown off, because it’s a rare shop in this state that focuses so strongly on the books! I’m definitely going to be dropping back by in August when I head down to the Indiana Toy and Comic Expo! If anything has changed, I’ll grab new photos and update the post! Plus, I hope to run into you! Thanks for taking the time to read the post, and reply! I really appreciate it! I hope I put the shop in a good light, because everyone in the group I was with was impressed!